The Dora the Explorer toy kitchen is a best-selling Fisher-Price product and continues to be a favorite toy for girls ages 3 to 10 years. Dora the Explorer, the creation of Chris Gifford, Rick Velleu, Valerie Walsh, and Eric Weiner, first aired as a pilot in 1999 and continued as a regular series in 2000. Shown on the Nickelodeon television network, Dora continues to enthrall boys and girls with her stories of adventure. Dora, as the main character, is portrayed as a brave young girl who ventures out on a new rescue adventure during each episode. As she attempts to help someone or find something, she involves the viewers at home by asking them to aid her in her quest. Along the way, she gives mini-Spanish lessons by introducing short words and phrases to the children who watch her. The series' popularity has led to a variety of marketable Dora products, including playsets, action figures, DVDs, ride-on toys, plush dolls, books, clothing, hygiene products, play tents, and of course, the Dora the Explorer toy kitchen. Dora's toy kitchen has garnered several awards, including "Toy of the Year Award," "Property of the Year" prize, and the "Best Girl Toy", which is awarded to the most innovative toys. It continues to be reputed as offering a high-quality play experience because of its consistency to the show's values and its place in the hearts of young girls and their parents. At the heart of the toy kitchen's success is its focus on emphasizing bilingual skills with a combination of fun and adventure with Dora. 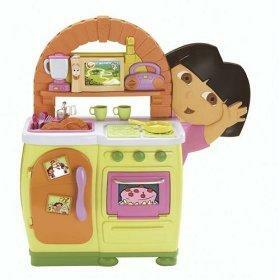 Why should you buy your daughter a Dora the Explorer kitchen? Of course the simple answer would be because she'll love it, but there is more to the subject than just purchasing another toy. Pretending is more than just child's play. As children pretend, they develop reasoning and thinking skills, and parents can encourage this by providing their children with toys and activities that fascinate them, opening a world of curiosity that educates and motivates kids to think. While you might not consider a toy kitchen an educational toy, think again. Kids learn by mimicking what they see. Your child watches you cook, read, pay bills, listen to music, drive the car, and more. Each toy that you purchase which copies these activities helps prepare your child for the world as she grows. Thus, a toy kitchen can provide your child with the opportunity to practice a variety of skills that she'll one day use for real. A 12-inch Dora doll allows your child to dream up all sorts of adventures in the kitchen with her beloved friend. The kitchen's five recipes and adventure maps provide a variety of lessons, such as recognizing and locating recipes. When a map is pressed after the insertion of an adventure card, kids can locate the ingredients to one of the available recipes. Simple recipe directions allow children to prepare several fun pretend recipes. The kitchen includes 28 miniature kitchen items, including plastic foods, utensils, pots and pans, and more. The kitchen includes a variety of sound effects including the following: English and Spanish phrases, kitchen sounds, and music. If you haven't already purchased Dora's toy kitchen, light up your little girl's world today!